Internet Media — Kathleen Beckman, L.H.S. Theresa Zoe Williams tells us, “… this Marian vocation of “living as contemplatives in action” can be very hard in this modern world”. In her feature article on Epic Pew website, Theresa shares excerpts from Kathleen’s book, “When Women Pray; Eleven Catholic Women on the Power of Prayer”. You can read the article >here. In the Archdiocese of Los Angeles, people can read Catholic news on the ‘Angelus News’ website. This past October 25, 2018, Kathryn Jean Lopez authored the article, “Less Noise, More Surrender: The Wisdom of the ‘Marian Option’”. What does it mean to be Marian? Find out more as Kathryn quotes from Kathleen’s book, “When Women Pray”. You can read the full article >here. WOMEN OF GRACE host Johnnette Williams welcomes guest Kathleen Beckman. 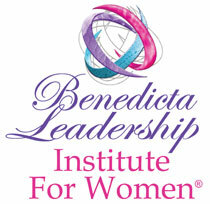 Johnette interviews Kathleen who speaks at Women of Grace Benedicta Leadership Institute Conference in Malvern PA. It is entitled, “Women: God’s Special Weapon Against Evil.” Kathleen's lecture includes, her lecture on St. Edith Stein's Teaching: Women, God's Special Weapon Against Evil. Listen to the audio interview below. "How Does Lent Lead to Healing?" March 21, 2018 Kathleen Beckman tells us of "7 Keys To Healing Liberation" in her talk with host, John Harper on the Morning Air show on the Relevant Radio website. Kathleen shares this one hour talk with Fr. Andrew Small, Joe Boland and Linda Kracht. Kathleen's portion begins at 23:28. To listen click the play button below. ``On Call`` with Wendy Wiese is an audio podcast on the Relevant Radio website. July 6, 2017 Wendy interviews Kathleen Beckman discussing her book, ``When Women Pray - Eleven Catholic Women on the Power of Prayer``. In this interview the importance and power of prayer is reiterated throughout. Listen to this interview by clicking play below. May 20, 2017, Kathleen Beckman was one of the speakers at the Ave Maria University Marian Eucharistic Conference: 100 Years of Fatima: A Message for Today. Learn more about the extraordinary events that happened at Fatima a century ago and how it affects our world today. To view the video simply click the image. Praying for our priests is becoming more important these days and who better to explain why than a priest. 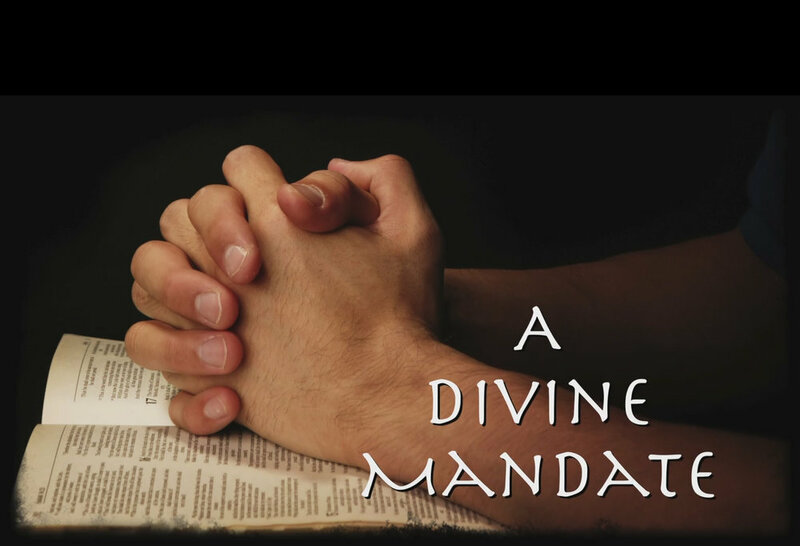 Lisa Flood, with Focus TV, interviews Father Andrew Merrick and Kathleen Beckman in an episode called, "A Divine Mandate". Father Andrew's joy seems contagious as he describes his calling and how he felt others were praying for him. In this video you'll also get to hear how Kathleen was called to spiritual motherhood and praying for priests. The video is available to watch on Vimeo >here. EWTN's Rome bureau chief, Joan Lewis is also known as Vatican Insider and hosts her blog called Joan's Rome. On May 27 and June 3, 2017 Joan interviews Kathleen Beckman and Dr. Luis Sandoval about exorcisms, exorcists and the course they took on this subject recently in Rome. Joan also collaborated on the book, "When Women Pray: Eleven Catholic Women on the Power of Prayer". You can listen to both "Examining Exorcism" episodes by clicking the play button(s) below. "What Happens When Women Pray?" Kathryn Jean Lopez writes an article published May 30, 2017 on the CRUX web site. In it Kathleen Beckman speaks to Kathryn Jean Lopez, one of the book’s contributors, about what women offer the Church, modeled best by the Blessed Mother. That book is, "When Women Pray: Eleven Catholic Women on the Power of Prayer". In their dialogue Kathleen will describe, "... I believe that readers will be edified by the personal stories of the eleven women writers who, with transparency write about their struggles, challenges, and triumphs in living according to the Gospel." You can read full article by Kathryn Jean Lopez by clicking here > CRUX web site. 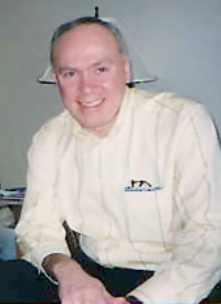 Michael O'Neill is the host of The Miracle Hunter radio show on Relevant Radio. On October 30, 2016, one night before Halloween, Michael talks about exorcism as he interviews Kathleen Beckman to discuss a book written by Father Gabriele Amorth called, "An Exorcist Explains the Demonic - The Antics of Satan and His Army of Fallen Angels". His book is available from Sophia Institute Press. Fr. Amorth (1925-2016), a priest of the Congregation of San Paolo, was internationally recognised as the world’s greatest exorcist. His mission of expelling the devil through incessant dedication has earned the gratitude of thousands of believers and the esteem of the most important authorities of the Catholic Church. Since Father Amorth recently passed, Micheal talks with Kathleen about the book, exorcism and more. You can listen to Michael O'Neill's interview of Kathleen Beckman now by clicking below. Kathleen Beckman interviews Father Donald Calloway on her Radio Maria weekly program which aired September 13, 2016. They discuss Fr. Donald's newest book, "Champions of the Rosary: The History and Heroes of a Spiritual Weapon". You will hear Fr. Donald talk about the history of the Rosary and a few glimpses of the heroes alluded to in the title of the book as well as how he created the book. This compelling interview can be heard on Radio Maria by clicking here. Eucharist, Mercy and Saint is a series that explores the many facets of Eucharistic life toward healing and holiness. Taking from Pope Pope John Paul The Great’s “Ecclesia de Eucharistia”, Kathleen emphasizes the transformative power of the Sacrament of Divine Love to “rekindle Eucharistic amazement”. You can listen to this broadcast by clicking here. Aleteia is a Catholic social networking website that gathers together "seekers of the truth" - a project of the Foundation for Evangelization through the Media (FEM), developed under the patronage of the Pontifical Council for Social Communications and the Pontifical Council for Promoting New Evangelization. Aleteia describes itself, in it's YouTube video, as "The 1st Question and Answer Community About Faith, Life and Society". July 22, 2016, Kathryn Jean Lopez writes an article announcing the first time the Church celebrates the feast of St. Mary Magdalene. In her article Kathryn gathers a symposium of Catholic women to share their thoughts on the "Apostle to the Apostles", including a submission by Kathleen Beckman. Learn more about the significance of this new feast day by reading Kathryn's article here. During Holy week, Arise and Shine Acadiana Radio re-aired an Interview hosted by Adam Conch featuring Kathleen Beckman. They discuss the need for Divine Mercy in a troubled world and how so many people don't realize their need for God's Mercy. Kathleen tells us how the Eucharist makes us vessels of Mercy rather than simply social workers talking about mercy. You can listen to this re-broadacst now by clicking the link below. The Catholic Exchange podcast is your daily source for spiritual encouragement and information. Our goal is to help make saints in our time. Join Michael J. Lichens and several CE authors discussing articles and the latest topics. February 16, 2016 Michael J. Lichens interviews Kathleen Beckman to discus her Jubilee Year of Mercy book, "God's Healing Mercy". You can listen to this enlightening podcast on the Catholic Exchange web site by clicking here or click the link below. Just four days after Pete Socks writes his review of Kathleen Beckman's Jubilee Year of Mercy book, "God's Healing Mercy", he has posted his interview with Kathleen herself. This written interview describes the why, how and what which brought this book into publication. Kathleen provides insights and excerpts from her book and gives us a glimpse of what to expect as you read this most inspirational book about God's Mercy. Pete's interview can be read by clicking here. Catholic Book Blogger - Reviews "God's Healing Mercy"
The Patheos website hosts a wonderful book review section titled, "Catholic Book Blogger" featuring writer, Pete Socks. January 27, 2016, Pete posted his review of Kathleen Beckman's Jubilee Year of Mercy book, 'God's Healing Mercy'. The review is concise and revealing, offering a glimpse of what to expect from Kathleen's 'self-guided retreat', as Pete describes her book. You can read this review now by clicking here. If you would like an opportunity to win a free copy of Kathleen's book, 'God's Healing Mercy', from Catholic Book Blogger, visit Pete Socks' CBB Giveaway page before 12 AM, February 6, 2016 by clicking here. It is now 43 years since the verdict was decided in the Roe vs Wade judgement in the U.S.A. - abortion is mandated. This grim situation is tolerated even by Christians who may have forgotten that the United States of America was founded upon Christian values. But, even after four decades, the debate continues. For those not familiar with the case, details can be read on Wikipedia. In this Extraordinary Jubilee Year of Mercy, it is helpful to read, "Seven Women on Mercy: Marching for Life in the Year of Mercy", an article by Kathryn Jean Lopez on the Catholic Pulse web site. Kathleen Beckman quotes Mother Teresa and her teachings on abortion. Please read the article by clicking here. The Radio Maria web site has posted an encore presentation of Living Eucharist from March 16, 2015 in which Kathleen Beckman dialogues with best selling author Michael Brown, founder of spiritdaily.com. They discuss the power of confession as a healing sacrament, Marian apparitions, and spiritual warfare responses. This program can be heard now by clicking the link below. Shortly after Sophia Institute Press released Kathleen's new book, "God's Healing Mercy", EWTN Catholic Radio's 'The Good Fight' broadcast an interview hosted by Barbara McGuigan talking with Kathleen Beckman, the book's author. You will hear Kathleen explain the Jubilee Year of Mercy called by Pope Francis. This interview was posted on SoundCloud, December 12, 2015, but you can listen to it now by clicking the link below. On the opening day of the Jubilee Year of Mercy announced by Pope Francis, the National Review web site releases it's article, "The Healing Power of Divine Mercy", by Kathryn Jean Lopez. A quote from Kathryn's article and Kathleen Beckman's book, "God's Healing Mercy" reads, “Mercy enables us to acknowledge and confront our weaknesses. It beckons us to turn away from sin and go back to Jesus,”. Learn why Kathleen wanted to proclaim God’s healing mercy and how we can all discover the magnificence of Divine Mercy. 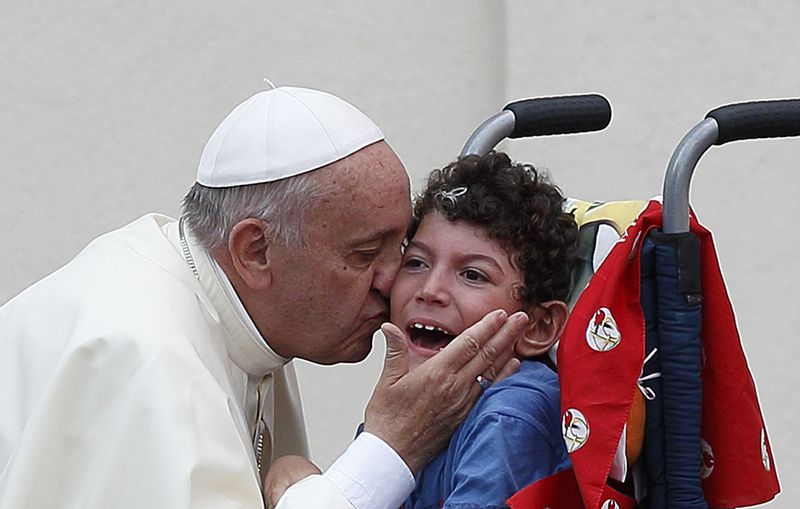 Pope Francis kisses a child as he arrives to greet participants in the Renewal of the Spirit meeting in St. Peter's Square at the Vatican July 3. The Tidings Online web site is published by Archbishop José H. Gomez in the Archdiocese of Los Angeles, the largest Catholic archdiocese in the United States. Their Angelus News webpage has posted an article by Kathryn Jean Lopez, with the heading, "A How-To Guide to Mercy". This is an insightful Q&A between Kathryn and Kathleen Beckman in which readers learn more about the serenity of forgiveness, the poison of unforgivenes and the merciful compassion of Jesus Christ. Read Kathleen's answer to Kathryn's question, “Who needs the healing?”. See the article by clicking > http://www.angelusnews.com/entertainment/books/a-how-to-guide-to-mercy-9601/#.VmegZXYrJ1b. As the Extraordinary Jubilee Year of Mercy begins, the Catholic Pulse web site has published an article by Kathryn Jean Lopez titled, "Go to the Mother of Mercy: Beginning the Jubilee of Mercy". In it Kathryn gives us several excerpts from Kathleen Beckman's newest book for the Holy Year of Mercy called, "God's Healing Mercy". Pope Francis invites us all to see the face of Mercy in Jesus Christ, but also the Mother of Mercy, as Pope Francis refers to the Blessed Virgin Mary. This article can be a start for you and Kathleen's book can be a way to enter into this Jubilee Year of Mercy with the passion that comes from hearing the Merciful Words of God. You can read the article on Catholic Pulse by clicking here > http://www.catholicpulse.com/cp/en/columnists/lopez/120715.html. DAY, TIME AND TITLE CHANGE FOR KATHLEEN'S RADIO MARIA PROGRAMS EFFECTIVE NOV. 1, 2015. Radio Maria has updated Kathleen Beckman's weekly live radio programs. New Title: Mercy and the Eucharist. Radio Maria Studios call in telephone line to speak to Host or Guest with prayer intentions or comments: 866-333-6279. All programs are archived on http://radiomaria.us/living-eucharist. Listeners on the West coast can tune in one of a couple of ways: go to http://radiomaria.us/ and listen on-line or iPhone, Blackberry or Android users can download a FREE app for Radio Maria and listen on their cell phone device. Check out the great guests that Kathleen has interviewed: bishops, priests, and lay leaders. Kathleen also offers catechesis on Eucharistic life and prayer, Divine Mercy and the ministry of healing and deliverance. The Women of Grace television program discusses contemporary issues from a Catholic perspective and affirms women in their dignity as daughters of God and their gift of authentic femininity. In this episode, from May 11th, 2015 entitled "Spiritual Motherhood: The Call and Gift of Woman", Johnnette Benkovic interviews Kathleen Beckman and Father Joseph Aytona. To view this episode of Women of Grace just click the following link - http://www.womenofgrace.com/en-us/media/tv/details.aspx?id=1187. On this Women Of Grace Radio program from October 23, 2015, Johnette Benkovic hosts a call in show with Father Joseph Aytona and Kathleen Beckman discussing 'the call and the gift of woman'. As it says on the EWTN web site, "... you will see life differently after listening to this". The people calling in to the program help turn this talk into a "spiritual pick-me-up show". Now you can listen to this EWTN broadcast by clicking the button below. This episode of EWTN's 'The Good Fight' was broadcast February 7, 2015. Barbara McGuigan is the host and she talks with Kathleen Beckman about the book, "Praying for Priests: A Mission for the New Evangelization". You can listen to the entire program now by clicking the button below. or listen now by clicking the link below. Allison Gingras is the host for 'A Seeking Heart' on Breadbox Media. On July 21, 2015 she chats with Kathleen Beckman about the book, "Praying for Priests: A Mission for the New Evangelization". The web site for this podcast is located at > http://breadboxmedia.podbean.com/e/a-seeking-heart-feat-kathleen-beckman-praying-for-priests-073115/. Al Smith, The Pipe Padre on Radio AM 530 in Toronto, Ontario, Canada interviews Kathleen Beckman as she shares her love in promoting two devotions near and dear to her heart. The need to encourage everyone to spend a holy hour in prayer along with a daily devotion of praying for priests. You can view the web site for this show at https://www.mixcloud.com/thepipepadre/kathleen-beckman-praying-for-priests-radio-am-530-ciao-toronto-march-11-2015/. This interview is on the Word On Fire web site, which was created by Bishop-elect Robert Barron. On their blog, Jared Zimmerer interviews Kathleen Beckman regarding her book, "Praying for Priests: A Mission for the New Evangelization". Jared is a Catholic author, speaker and blogger. The printed interview can be read at the Word On Fire Blog here > http://www.wordonfire.org/resources/blog/praying-for-priests-an-interview-with-kathleen-beckman/4572/. Tuesday, September 1, 2015, Pope Francis released his letter about abortion and mercy in which he allows all priests to grant forgiveness to women who have elected to have an abortion and profoundly regret the procedure. The Holy See has opened the door for women who have had abortions – an act considered a grave sin by the Catholic church – to be absolved if they express contrition and seek forgiveness from their priest. “The forgiveness of God cannot be denied to one who has repented,” the pontiff wrote in an extraordinary letter that was released by the Vatican on Tuesday. “I am well aware of the pressure that has led them to this decision. I know that it is an existential and moral ordeal,” he added. If you would like to read some excerpts from Kathleen's book, "Praying for Priests: A Mission for the New Evangelization", they have been posted on the RenewAmerica web site. The excerpts are from the chapter "Heroines of Spiritual Maternity" and they're presented on RenewAmerica by Matt C. Abbott. To read the excerpts go to > http://www.renewamerica.com/columns/abbott/141111. The web site called Patheos, brings together faith communities, academics, and the broader public into a single environment. They host the 'Catholic Book Blog' where Pete Socks interviews Kathleen Beckman to talk about her book, "Praying for Priests: A Mission for the New Evangelization". This is a printed interview which you can read here > http://www.patheos.com/blogs/catholicbookblogger/2015/01/11/cbb-interview-with-kathleen-beckman/. The Catholic Mom web site endeavours to share only information which is in adherence to the magisterium of the Catholic Church. In this email conversation, Lisa M. Hendey chats with Kathleen Beckman about the "Foundation For Prayer For Priests" and Kathleen's book, "Praying for Priests: A Mission for the New Evangelization". 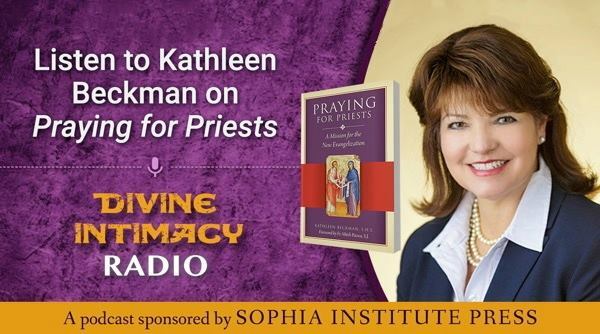 Join them in this conversation by clicking here > http://catholicmom.com/2015/03/09/kathleen-beckman-encourages-us-to-pray-for-priests/. Endow is an educational apostolate that writes study guides for small groups of women that makes the rich wisdom of the Church accessible to the 'woman in the pew'. On their web site, Eileen Love has written a review of Kathleen Beckman's book, "Praying for Priests: A Mission for the New Evangelization". Eileen's review is available on their web site at > http://endowgroups.org/book-review-praying-for-priests-a-mission-for-the-new-evangelization/.